EXPLORE THE 4th GRADE CURRICULUM. A rigorous curriculum is geared to the interests of fourth graders as well as full of the needed skills work and comprehension practice that prepares students to become more independent, critical, and reflective readers. Quarterly novel studies in various reading genres, a cross-curricular research paper, interesting options for book reports, and the encouragement of outside reading round out Wood Acres comprehensive program. Undergirding the literature program is a continued emphasis on mastery of proper grammar, proofreading skills, vocabulary development, and an appreciation of quality reading and writing through author studies. Fourth graders are literate and loving it. Continuation of our rigorous math program in fourth grade provides a seamless transition in both reinforcement of the all-important math facts and basic operations to the challenges and eventual success of working with multi-step problems and numeric operations. Imbedded in the fourth grade curriculum is a strong piece of pre-algebra work that will well prepare the student for advanced math in the Upper School. Work with perimeter, area, volume, decimals, fractions and geometry round out the year. Application of math skills to other areas of learning such as science create concrete evidence for fourth graders that learning is connected and not a series of isolated skills. More commonly referred to as Social Studies, Wood Acres considers each component of a traditional social studies program important enough for academic consideration on its own merits. Based on the National Geography Standards established by The National Council for Geographic Education, student knowledge of where we are in time and space is a vital life skill in an ever-shrinking global community. Geographic skills are covered and applied through a study of the regions of the United States through use of texts, maps, globes and class projects. Through the use of historical timelines, fourth graders are encouraged to create one of their own lives. Further student learning is focused on history, economics, culture, ethics and belief systems as well as social and political systems. Vocabulary development is vital to the conversation of the social sciences as well as oral and written student presentations. Microscopes, chemistry, matter, energy, ecosystems, light, optics, nutrition and several other topics are components of the fourth grade science curriculum. Dynamic implementation of the Wood Acres School’s groundbreaking science curriculum literally leaps from the mind-numbing “read the chapter and answer the questions” approach to a hand-on, experiential laboratory setting that has fourth graders truly learning and living the scientific process. Taught through integrated CELLS (Core Experience Learning LabS) our curriculum modules provide in-depth study of the topics mentioned earlier. Lab coats, goggles, a state-of-the-art laboratory, trained lab specialists, and an inquisitive mind in each fourth grader will have the scientific process well established in each student. The Wood Acres School is most proud of its designation as an International Spanish Academy from the Embassy of Spain and the Consulate of Spain in Washington, DC. This recognition has been awarded to less than 100 schools in the United States and Canada for outstanding programming and commitment to the development of bilingual graduates. With Wood Acres Spanish program beginning with three-year-olds, the student of Spanish in fourth grade is demonstrating a quite sophisticated command of the language for other students by his/her age. Taught by native speakers with a formal curriculum imported from Spain, acquisition of foreign language skills is outstanding at Wood Acres. Instructional methodology includes TPR, total pupil response, which encourages students to become comfortable in speaking, listening, writing, and reading Spanish. Learning a language is about confidence and culture and collaboration as well. Fourth graders readily set their sights on eventual foreign travel to try out their skills. Fourth graders are interested in team activities, individual physical challenges and the sheer pleasure of free play. Physical fitness skill units have students working throughout the year on improvements in running, stretching, strength, and endurance. Intermittent team games help both skill development and team spirit. 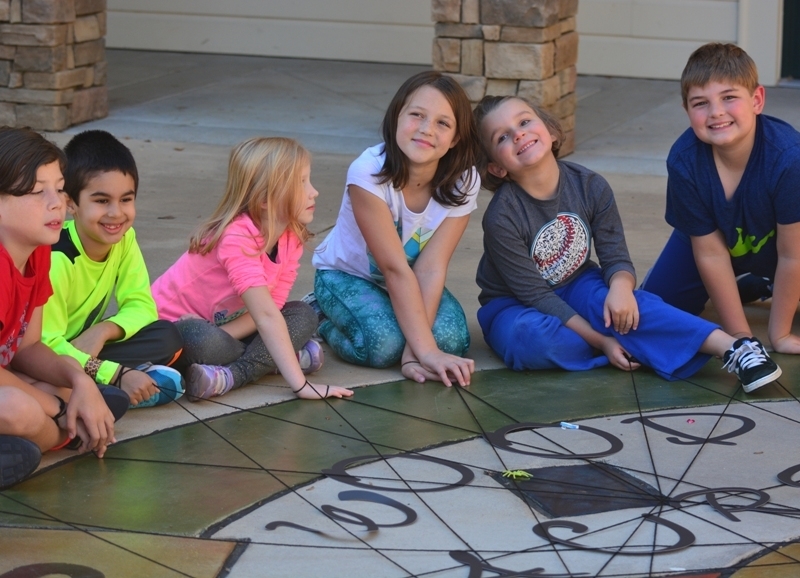 Taught by an accomplished artist in her own right, the Wood Acres art program for fourth graders is a natural continuation of rich curriculum in the Grammar School. With an ever-refined eye for line, form and perspective fourth graders blend didactic instruction with creative, edgy and captivating art projects. Students are trained to look at the world through the eyes of an artist, seeing lines of symmetry, perspective, geometry, color, balance, shading, tone, and depth as the art of nature and man’s creation. Pride in artisitic effort is on display during bi-annual art shows. Blending multiple music methodology such as Kodály and Orff, the Wood Acres music program helps create students who become educated audiences as well as engaged performers. Musical behavior is basic to all cultures, be it primitive and/or sophisticated. Program goals focus on comfortable and accurate singing, comfortable and accurate moving, and expressive sensitivity when listening and/or responding to music. Music at Wood Acres is both an art form and a language or method of communication often referred to as Conversational Solfege. Students read music, perform with instruments, and learn about the culture surrounding the music they study. Technology is as common in a fourth grader’s life as food and friends. By honing computer skills from keyboarding, to Microsoft Office skills, to responsible Internet use, fourth graders at Wood Acres learn how technology enhances all teaching and learning. A technology specialist meets regularly with classroom teachers to plan projects that relate directly to academic areas in the fourth grade curriculum. Fourth graders will work on a literary project in the lab using Microsoft Word during one lab period and then use the Internet to present scientific findings to the class in the next. Technology is used responsibly, effectively, and creatively to enhance teaching and learning for the maturing fourth graders and their widening areas of interest. Students also frequent the STEM lab, known as the HIVE, to engineer everyday problems and work on their programming skills among other activities.